The ooter circle haes a mairch that contains sheaves o wheat an the inner sheaves o rice reflectin the Maoist philosophy o an agricultural revolution. At the centre o the bottom portion o the mairch is a cog-wheel that represents the industrial workers. Thir elements thegither wur designed tae seembolise the revolutionary struggles o the Cheenese fowk syne the Mey Fowert Movement, an the coalition o the proletariats which succeedit in foondin the Fowkrepublic o Cheenae. 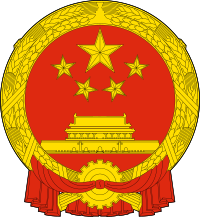 The emblem wis designed bi Liang Sicheng, a famous architect, in a competeetion held at the foondin o the Fowkrepublic o Cheenae wi obvious similarities tae the seembols uised bi the USSR. It wis determined as the Naitional Emblem on September 20, 1950 bi the Central Fowkgovernment.